A fascinating map from Gothamist shows the divide in this week's gubernatorial candidate for incumbent Gov. Andrew Cuomo (purple) and challenger-from-the-left Cynthia Nixon (orange). 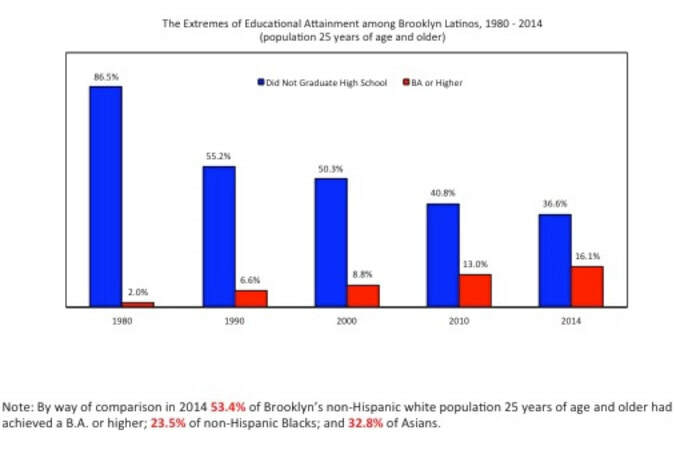 First, let's put aside that there are sections of Brooklyn that vote Republican, at least in national elections--notably Orthodox Jews and older white ethnics. Those voting in the Democratic primary went for Cuomo. What's notable is that Nixon's support came in better-off, mostly white neighborhoods known for higher incomes and gentrification. Starting in the north, she won all of Greenpoint, the western part of gentrifying Bushwick, and the better-off areas of Williamsburg, excluding the Hasidic section and predominantly Latino blocks. 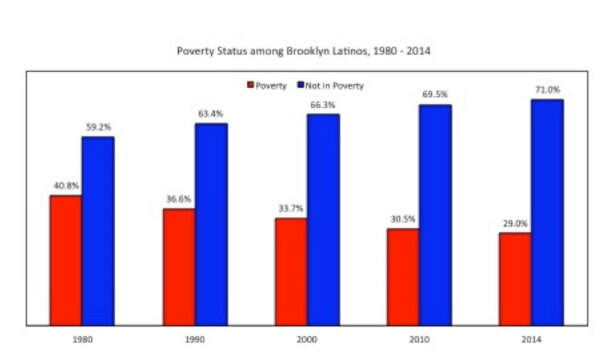 In the "central" part of her support, Nixon won gentrified neighborhoods like DUMBO, Brooklyn Heights, Cobble Hill, Park Slope, Fort Green, and Clinton Hill, plus the western sections of Bedford-Stuyvesant and Crown Heights. The "islands" of purple are mainly clusters of lower-cost housing, including public housing and Mitchell-Lama buildings. Moving south, the gentrification map shows "Greenwood Heights" (actually part of Sunset Park) near the waterfront, some better-off blocks within Sunset Park, and pockets of Bay Ridge. Moving southeast of Park Slope, all of Windsor Terrace is orange, bordering the "elbow" of Prospect Park, while significant chunks of Ditmas Park/Prospect Park South (within Flatbush) are orange. Then there are pieces of Kensington to the west and Prospect-Lefferts Gardens to the east. What about the orange pieces in the south of Brooklyn, to the northeast and northwest of Coney Island? Not sure. This is fascinating. The New York Times, in an "extremely detailed" national map of the 2016 presidential election, allows readers to drill down to the precinct level. 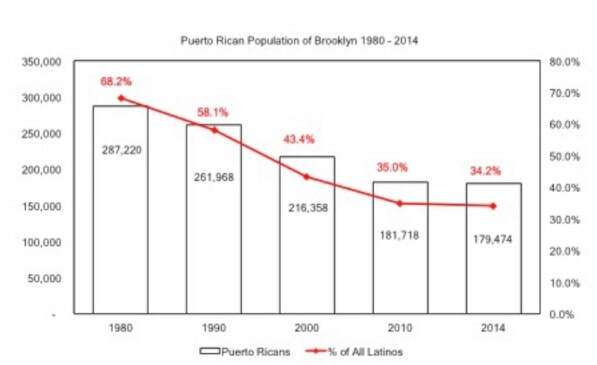 The screenshot below focuses on Brooklyn. Those voting for Trump are mainly Orthodox Jews (Hasidic and non-Hasidic), and residents of mostly white enclaves. In the northern section of Brooklyn, next to the uninhabited Brooklyn Navy Yard (in gray), is the Satmar Hasidic section. Somewhat southeast, in part of Crown Heights, is the Lubavitch Hasidic section. Southwest of there, the largest concentration of red is in Borough Park, significantly Hasidic (notably the Bobov sect), and then Modern Orthodox Midwood going south. Other neighborhoods with red include Bay Ridge and Dyker Heights in the southwest, with large Italian-American and Greek-American populations; Brighton Beach and neighboring Sheepshead Bay, with many residents from post-Soviet nations (Russia, Ukraine, Uzbekistan), and middle- and upper-class predominantly white neighborhoods like Manhattan Beach and Marine Park, which have a mix of residents, both native born and immigrant. ​The rest of Brooklyn is very, very blue. 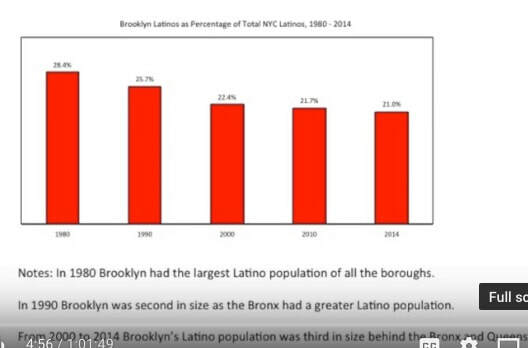 The charts below are screenshots from a presentation (video) made on April 19, 2016 at the Brooklyn Historical Society by Laird Bergad, Executive Director of CUNY's Center for Latin American, Caribbean and Latino Studies. He was part of a panel on the the changing demographics of the Latino community, which also included Nisha Agarwal, Commissioner of the Mayor's Office of Immigrant Affairs, and Javier Valdes, Co-Executive Director of Make the Road NY, and was moderated by Jarrett Murphy, Executive Editor of City Limits magazine. 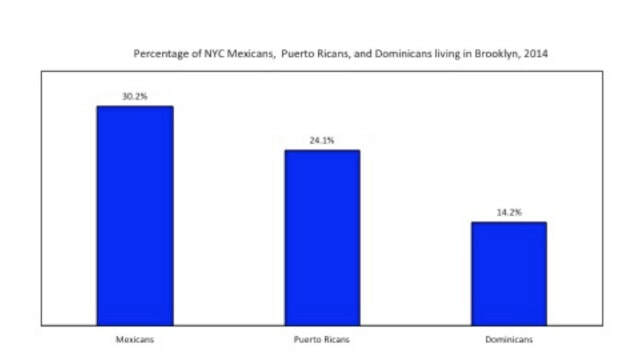 the Latino population is located most significantly in Sunset Park, Bushwick, and Williamsburg, but there are certainly other neighborhoods, including East New York, Canarsie, Cypress Hills (just west of Woodhaven), Coney Island, and Red Hook. One morning a few weeks ago, I was leaving the building where I live, on a quiet, historic block in Brooklyn, and found a large group of tourists outside on the sidewalk, selfie sticks in hand, led by a guide who was shepherding them around the neighborhood as he lectured. Over the past several years this has become an increasingly common scene in parts of the borough: the wondrous gazes of out-of-towners as they listen to anecdotes about the area’s literary and architectural past, turning to shock as they learn of the gargantuan sums people are willing to pay to live, in such close quarters, among the ghosts. Around the world, the spread of urban tourism into previously uncharted residential neighborhoods, a turn of events not all neighbors have welcomed, has largely been attributed to the growth of Airbnb and its promise of a more intimate experience of hospitality than modern times have typically permitted. In reality, that blame can be distributed more widely. Trends have been moving in that direction for a long time. In New York in particular, a decline in manufacturing jobs lasting decades prompted civic leaders to regroup, turning the city into a branded product that could be marketed to tourists and real estate interests around the world, who would emerge as a driving force of the economy. As an 18-year tour guide who specializes in Brooklyn and leads exactly one tour in Manhattan, my whole aim is to show visitors--as well as many New Yorkers of vintage short and long--parts of the city they wouldn't see on a first pass. I led a tour of Red Hook the other day and showed people the Patrick Daly mural. Or the painted mark on the exterior of the Red Hook Lobster Pound that shows the height of Sandy. I was bemused to click on this article's first hyperlink and be taken to a page listing a neighborhood tour I offer, among 25+ intricate walking tours--almost all in Brooklyn--I've devised in 18 years as a tour guide. Not only is that tour a rarely chosen offering, the most recent clients I had for it were a typical "group": four people, two local residents, plus two visiting relatives. No microphone, no crowd, no selfie sticks. We didn't block the sidewalk. We didn't just talk literary and architectural history, or expensive real estate, but also discussed the neighborhood's social history and gestalt. The route was customized, not presented as a "branded product." I recognize that large group tourism can be disruptive to residential neighborhoods, so I sympathize with Brooklyn Heights residents faced with daily amplified sound. (On the relatively few tours I lead that require microphones, I try not to use them on residential blocks.) And I was appalled to see a large tour bus unloading people in the middle of that historic district. That said, I think Ms. Bellafante's seeming discomfort with the city's outer borough tourism push is misplaced. I'm not part of NYC&Company's marketing effort, but the belated effort by Queens--2.3 million people!--to encourage tourism should be applauded. Heck, not enough New Yorkers visit Queens. This weekend I led 13 *New Yorkers* on a tour of Red Hook [in Brooklyn], parts of which--unlike Venice--were desolate. There's much to learn about our city. Everyone finds the social media outlet they like. For my tour business, I have a rather small presence on Twitter and Facebook. Truth be told, I have a relatively small business presence on Instagram, if you consider that a focused effort to market my tours. But I've grown to like Instagram, and each day post a photo of something intriguing to me that I see in neighborhoods where I lead tours: mostly in Brooklyn, but occasionally in Long Island City/Sunnyside, Queens, or the Lower East Side in Manhattan. A selection is below. Formerly Sons of Abraham synagogue, opened 1895 in #Williamsburg #Brooklyn, according to book the Lost synagogues of Brooklyn. It's not simple to distill a huge borough--the equivalent of a city--into a guidebook, much less an article or two. And as I traveler myself, I recognize that visitors often want to pack in as much as possible. So we should give the New York Times some slack for such articles as the recent 36 Hours in Brooklyn or the 2011 incarnation of 36 Hours in Brooklyn. Like other articles, they pack in some useful highlights and tips. However... it's difficult to avoid broad generalizations like this: "But south of Williamsburg, the borough’s character — both boisterous and architecturally beautiful, worldly with working-class roots — remains." To which I say: WTF? The borough's character is available north of Williamsburg, as well. (Frankly, parts of Williamsburg still have character too, despite the hipsterization.) 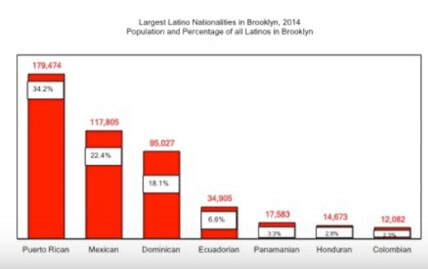 More importantly, Brooklyn is way too complicated and diverse for such a claim. Some of the "architecturally beautiful" neighborhoods have patrician roots, for example. But my biggest quibble concerns the pursuit of breadth over depth. If you followed the advice in the latest article, you'd traipse through DUMBO and go to the Brooklyn Roasting Company but not the chocolate shop (which does have coffee) Jacques Torres, which is a neighborhood gem. You'd walk to a restaurant named La Vara on a mostly residential block, Clinton Street, but not traverse the two parallel shopping streets, Court Street and Smith Street. And then you'd miss out on nightlife opportunities nearby, because the article tells you to hop over to Hank's Saloon many blocks away. 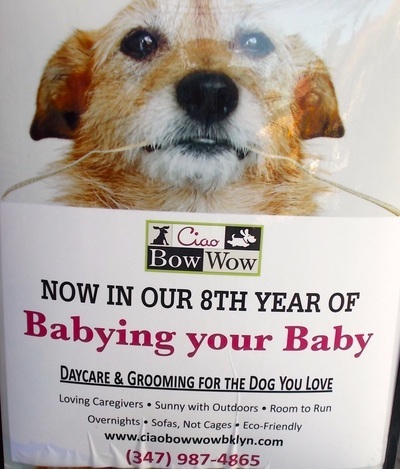 That's not a wise use of time and walking energy. I recommend a more concentrated effort to get more out of your surroundings. The Brooklyn Bridge is part of any Brooklyn tour: it's a treasure, for residents and for visitors. It's a legacy of 19th century ingenuity (and hardship), and it remains vital infrastructure that requires money and effort to maintain. So there's no reason--other than selfishness--to mar this awesome, venerable, and precarious piece of public property with "locks of love," a trend that has plagued Rome and Paris (and other world cities) in the past decade. Paris even has a group called "No Love Locks," which has helped get officials to remove locks and make bridges lock-proof. "Just a month ago, we had an overhead wire that people had hung so many locks to that it snapped under the weight,” Department of Transportation Commissioner Polly Trottenberg told CBS, which noted that last year the city had to remove 11,000 locks, which cost $116,000. So, if you want to memorialize your unbreakable love, please don't mar the Brooklyn Bridge with a lock, or even a lighter piece of fabric. It will just have to be cut off by the Department of Transportation and tossed in a landfill. And now there's a $100 fine and signs warning "No Locks. Yes Lox." New Views of Greenpoint's Oddly﻿ Graceful "Digester Eggs"
On Saturday, I got some new views of industrial Greenpoint, near the northeastern edge of the neighborhood, at the Kingsland Wildflower Festival. 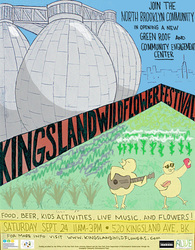 It celebrated the opening of the first 10,000 square feet of green roofs at 520 Kingsland Avenue: a building with three roofs has been planted with a combination of native grasses and wild flowers. Yes, there were terrific views, as advertised, of Manhattan, Brooklyn, Queens, and Newtown Creek, plus the opportunity to meet partner organizations. And the free food and beer were a surprise bonus. But the truly stirring things, as shown in the photos below, were the photos from the back--I'd previously only seen other angles--of Greenpoint's "Digester Eggs," which process sludge in a distinctly modern way. Partners include property owner Broadway Stages, landscaping firm Alive Structures, and the New York City Audubon Society, with funding from the Greenpoint Community Environmental Fund, which aims to translate an oil spill settlement into environmental gains for the neighborhood. 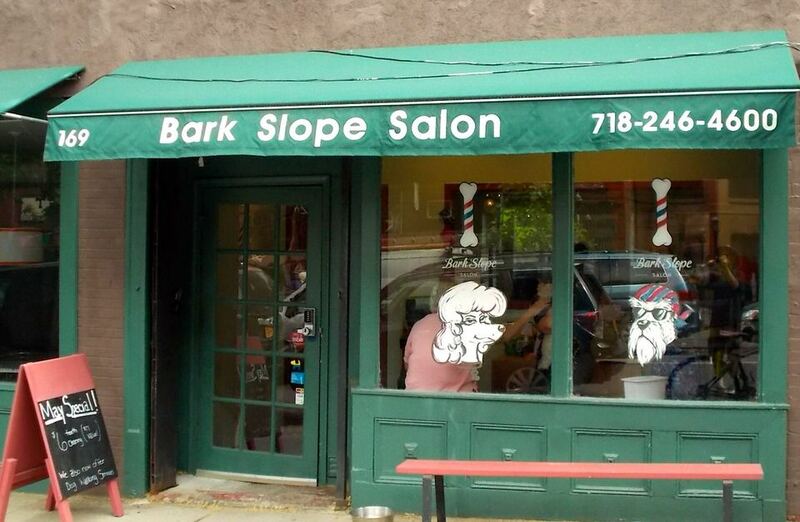 As I prepared for my Greenpoint tour tomorrow, with a special focus on the neighborhood's Polish presence, I couldn't help but notice two phenomena, somewhat in tension. While the population has been diminishing somewhat, as Polish-Americans move to Queens and the flow from Europe (after Poland joined the EU) slowed, some symbols of Poland remain ever prominent, representing the Polish and Slavic Federal Credit Union, the Polish National Home, the Warsaw Uprising, and a square named for a priest who was a prominent Solidarity activist.​ There's much more, of course--this is just a sample. 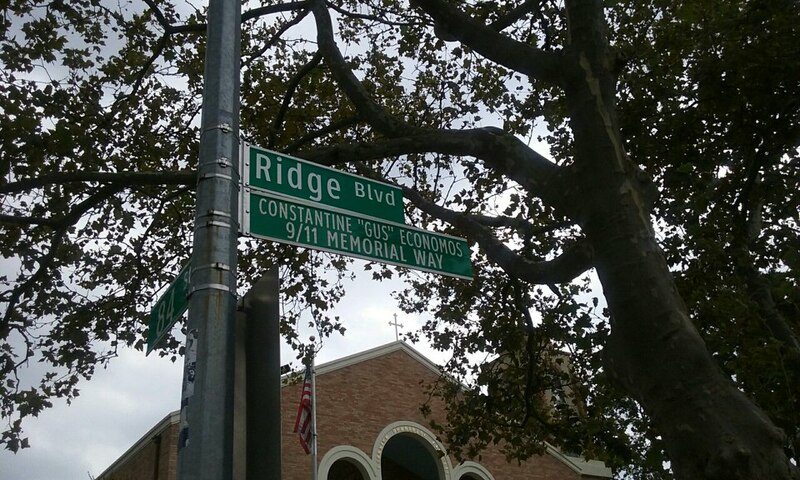 Constantine (Gus) Economos 9/11 Memorial Way Ridge Blvd. 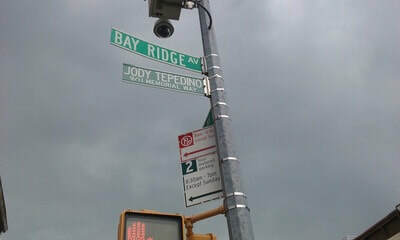 and 84th St.
Jody Tepedino 9/11 Memorial Way, Bay Ridge Avenue and 3rd Avenue. Actually, these were civilians. Hindy, Sullivan, and Tepedino worked at Cantor Fitzgerald. Economos and Casey worked at Sandler O'Neill. Yasmin and Miah, a married couple, worked at Marsh & McLennan. They were Bangladeshi immigrants and Muslims. Gotham Gazette explains that street co-namings have evolved, with some bestowed in sympathy for uniformed service people or civilians (including children) who died untimely deaths, and others honoring people with a long record of community service. 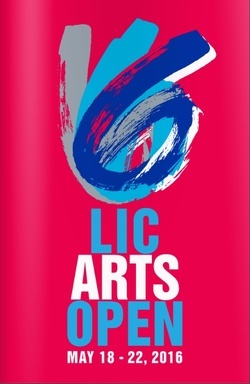 When, months ago, I scheduled my Long Island City walking tour for May 21 (via the Municipal Art Society), I thought the annual LIC Arts Open would be occurring the previous weekend, in the middle of the month. Instead, it's a great synchronicity, and an opportunity to see a lot of good art. I encourage visitors to get to LIC early and see some studios before the 2 pm walking tour. 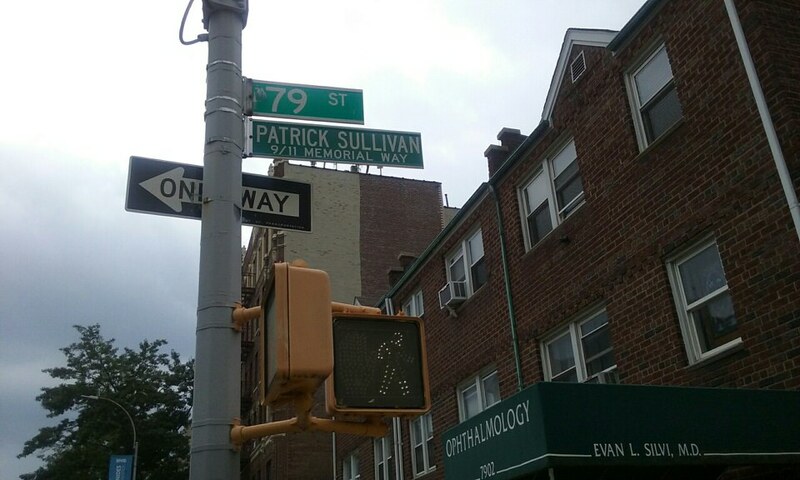 In preparing for my tour this Saturday, April 2, of East Williamsburg and Bushwick (via the Municipal Art Society), I've grown to appreciate just how fascinating and vexing these neighborhoods can be. The tour route includes several individual landmarks, but also passes many banal, workaday houses that played a hugely important role, filling in empty lots that scarred Bushwick after decades of neglect, thus positioning the neighborhood for its revival--and now, in some cases, furious gentrification. The latter might be exemplified by the story of how actress (and Girls ensemble star) Zosia Mamet bought a pink house in Bushwick in November 2013--a 3-family building with a legal basement office--and, as Bushwick Daily reported, decided to flip it in less than a year. 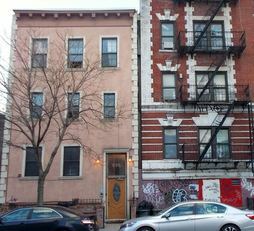 I took a look at the records, via StreetEasy: in 2006, the building sold for $699,000; in 2008, for $875,000. In 2013, Mamet and her boyfriend bought it for nearly $1.04 million; it sold last year for $1.375 million. Sure, the value may have risen through renovation and, who knows, maybe they decided the building was a better investment than home. (I'm not blaming nor praising Mamet, whose work I like; she's just riding the real estate wave.) Though the photo in the real estate listing, with its tight focus on the house and tree, makes it look almost bucolic, Flushing Avenue is a noisy truck route with few trees. However pleasant the pink house, it's not exactly in a historic district. It's across the street from a Herbalife distributor, for Pete's sake. And the apartment building next door is worn. But the house is in within walking distance of some trendy Bushwick/East Williamsburg bars and restaurants, and a massive new development--with a troubling back story--is coming nearby. In other words, from the real estate perspective, the long term trend is good. Note: the pink house is actually not on the regular tour route, but is on one of two paths to the subway from the tour ending point. I will be taking that path. Since 2000, I've led visitors around Brooklyn, and my two most fundamental tours, Brooklyn 101 and Brooklyn 202, go through Park Slope and cross Prospect Park West, usually at the Garfield Place stop light. When we cross, I advise people to look right and left in case bicycles approach. Then, on the sidewalk adjacent to Prospect Park, I describe the controversy over the Prospect Park West bike lane, which raised the ire of Borough President Marty Markowitz and some long-time (and well-heeled) residents of buildings along the block. I point out how, given the media megaphone focused on Park Slope, the controversy has made international news. The visitors are generally incredulous. 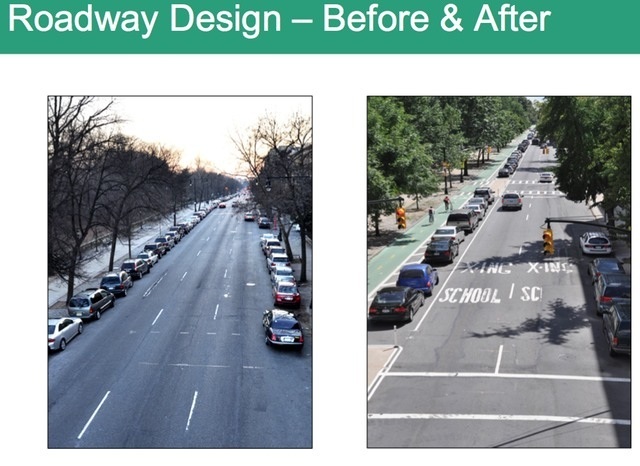 It seems a very reasonable trade-off to add a protected lane for bicyclists, thus narrowing a roadway conducive to speeding from three lanes to two. Yes, it may be less esthetically appealing to have vehicles park away from the curb and, yes, it may add a small degree of hazard for those crossing or parking/unloading. But, overall, it seems intuitive--and obvious--that the bike lane enhances safety. ​There's still a lawsuit going on. (Update: It was finally abandoned in September 2016.) 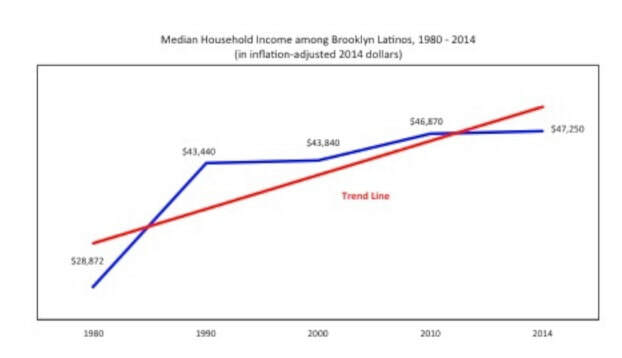 Below is a view of the "alarming" changes, via Gothamist. Beyond the very comprehensive FAQ about my tour business, I here address some broader questions that should be useful to both my tour clients as well as many others new to Brooklyn. I'll add to the list as more suggestions come in. 1) We can see "Brooklyn" in a few hours, or a day, right? Well, some of Brooklyn. 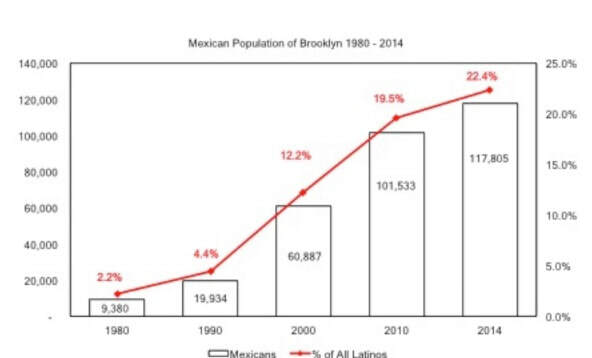 Remember, Brooklyn's bigger than Paris (within the peripherique), both in population and in area. My "Brooklyn 101" tour covers pieces of four or five neighborhoods, but only pieces, in 2.5 hours. My "Brooklyn 202" tour adds two neighborhoods and 2 hours. Both are significant introductions, but just that. The longest tour I've led has been nine hours, but even that was limited. A vehicle can cover more ground, but that sacrifices time walking the streets. And even those "Brooklyn Loop" bus tours are pretty limited. 2) "Brooklyn" is... rich, poor, cool, uncool, ethnic nostalgia, classic row-house streets, hipsters, striving immigrants, hip-hop authenticity, artisanal "makers." 3) I fear we can’t see “Brooklyn” unless we [take your tour/read this book/use this app]. There are many ways to experience Brooklyn, and each has trade-offs in terms of cost, time, and insight. You can take the subway and just wander. You can take a tour bus. Maybe your friend's cousin can take you around, or you can join a large-group scheduled walking tour. You can use an app, a web site, or a guidebook. Or you can hire a private guide like me and get more personalized attention and specialized knowledge. 4) If it's a "Brooklyn pizza" or a "Brooklyn bagel," it must be good. No, not necessarily. Not everything made/bought here has special magic "Brooklyn" pixie dust. You might (sorry) get better quality in Manhattan. Ask around, or do some research. That said, competition means the baseline should be relatively high. 5) Brooklyn has "a Jewish neighborhood," right? 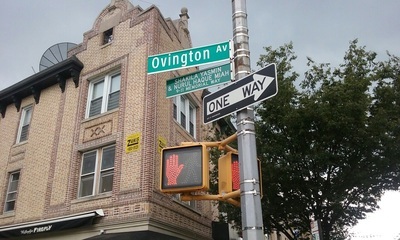 Brooklyn has many Jewish neighborhoods. Some are Hasidic, some are Modern Orthodox. Most are Ashkenazi, but one is Sephardic. And those are the visibly religious Jewish neighborhoods. Other mixed neighborhoods have Jewish institutions and populations, while others may have "lost" Jewish institutions transformed into churches or other functions. 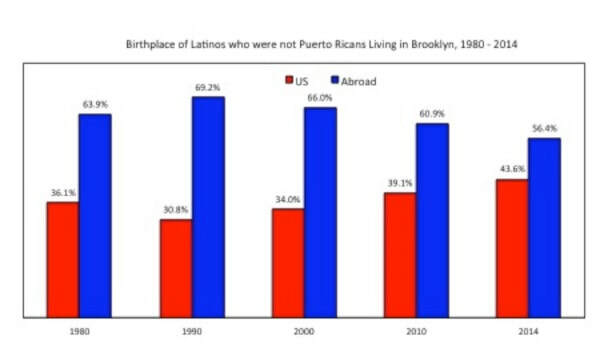 6) Brooklyn has some "ethnic neighborhoods," right? 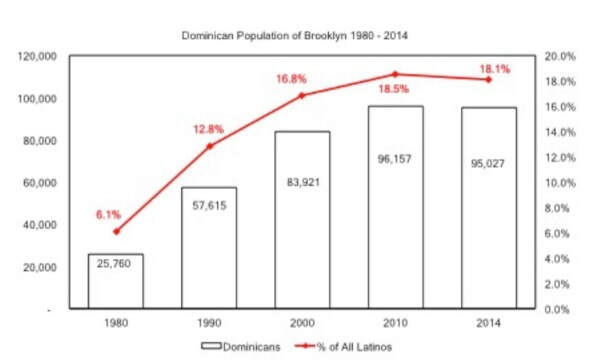 Brooklyn has many "ethnic neighborhoods." It has neighborhoods with multiple ethnic groups, some aligned by language, some very different. We might just call them "neighborhoods." 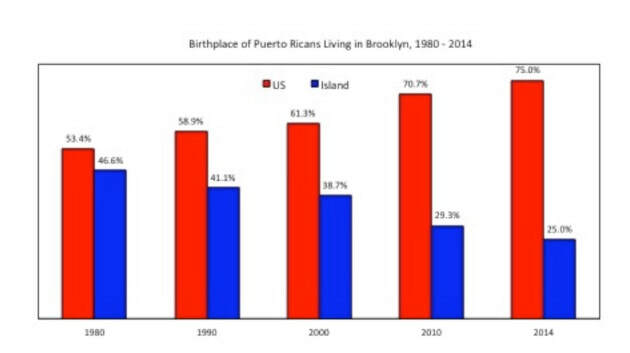 For example, the western part of Sunset Park is significantly Spanish-speaking, thanks to the migration (not immigration) of Americans from Puerto Rico, and the subsequent immigration of people from Mexico and Central America. The eastern part of Sunset Park is today significantly Chinese, moving into a neighborhood with Norwegian, Finnish, and Polish roots. Bensonhurst still has Italian roots, but now is significantly Chinese and "Russian" (which is a shorthand for "Former Soviet Union"). 7) If we visit Brooklyn, it's easy to see Coney Island. Well, Coney Island's well worth a visit, at least in decent weather, but it's a long trip--the end of four subway lines and a lengthy vehicle ride from many places in Brooklyn. It's terrific in summer. But do factor in travel time, if you want to see other neighborhoods. 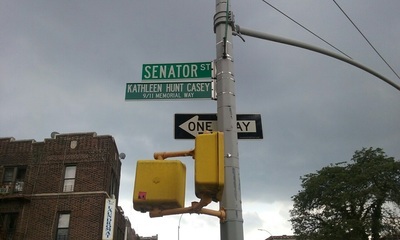 8) We only want to see one neighborhood (say, East Flatbush, or Bensonhurst), because that's where Aunt Bea grew up. Unless you're really tight on time, I call that shortsighted. 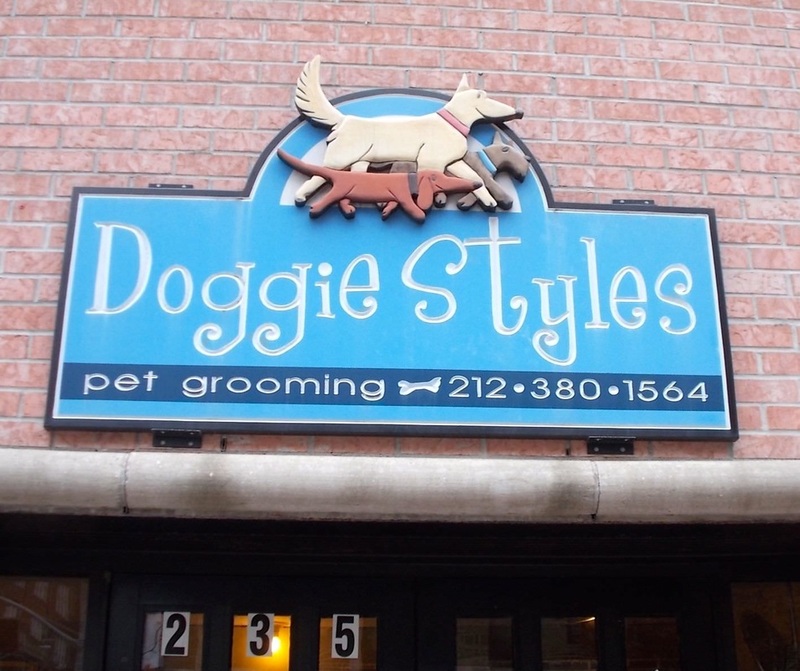 Most destinations in Brooklyn have a lot of interesting things we see along the way, or via a brief diversion. 9) We can see all of "Brooklyn"--classic brownstone streets, hipsters, hip-hop, ethnic variety, new retail--in just one neighborhood. Not exactly. (Remember I mentioned "trade-offs.") Sometimes the most settled, classic neighborhoods (here's looking at you, Brooklyn Heights) don't exactly have cutting-edge shopping or ethnic variety. You have to put a couple of neighborhoods together. A place like Williamsburg has a lot of the (now blunted) cutting-edge but almost no classic streets. 10) We can see "ethnic Brooklyn" and "hipster Brooklyn" in just one neighborhood. Maybe, but only if you define "ethnic Brooklyn" narrowly. 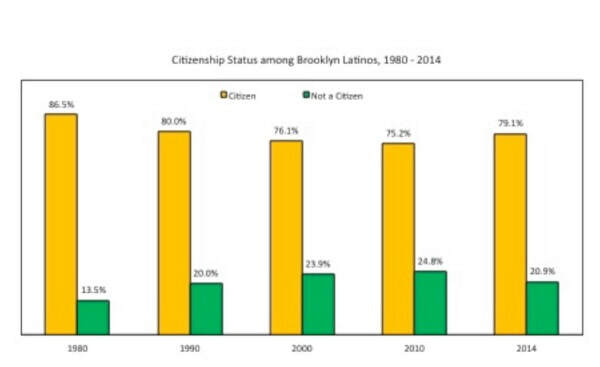 Greenpoint has a significant Polish community and an influx of newbies. The western part of Williamsburg has a Satmar Hasidic enclave and, north of it, the epicenter of gentrification. (There are Latino and Italian communities to the east.) Crown Heights has a Lubavitcher Hasidic enclave, as well as a West Indian community, as well as hipsters moving in. But do note these are very much partially "ethnic neighborhoods." 11) If we get a hotel (or room) in Brooklyn, it's easier to explore Brooklyn. 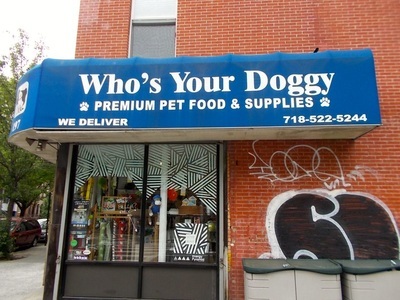 That depends. Some hotels are way off the beaten track. Others are deep in one corner of Brooklyn, and position you to visit one set of nearby neighborhoods, but not another cluster. Always check. Neighborhoods like Williamsburg and Bedford-Stuyvesant are huge, and a place in those neighborhoods may be far from area attractions. Location matters for transit, safety, and amenities. Even learning--say, via AirBnB--that you'd be on a specific named street or avenue may be meaningless without a cross street. 12) A hotel's name is a reliable geographic signifier. Actually, no. A hotel named "Prospect Park South" was not in the neighborhood Prospect Park South, nor was it directly south of Prospect Park. One "Brooklyn Downtown" hotel is a good ways from Downtown Brooklyn. The "Arena Hotel" isn't close enough to the Barclays Center to merit the moniker. ​That doesn't make such hotels unreasonable values, compared to alternatives, if you're comfortable using transit. 13) Neighborhood XYZ is "dangerous." 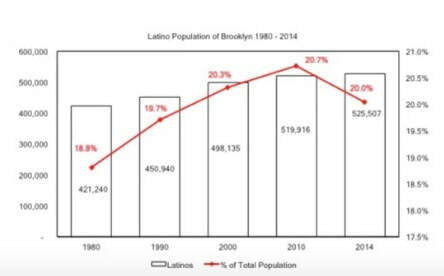 Brooklyn, especially the areas most visitors go, is generally safe, and has been getting safer. Avoid generalizations. ​That said, everyone has a different threshold. 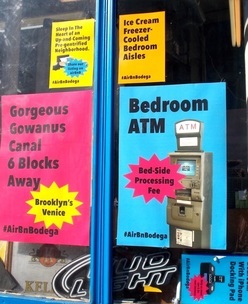 Perhaps Brooklyn's hottest, buzziest retail strip is Franklin Avenue in western Crown Heights. It's also had a couple of daytime shootings. That has stopped exactly nothing. Do check Spotcrime (and also recognize that many incidents happen in overnight hours, and among acquaintances). Use Google Street View. 14) We don't want to take the subway because it looked scary in the movie we saw or when we visited in the 1980s. Most New Yorkers take the subway. It's usually the fastest, cheapest way to get around, and it's full of people. So the small but not unknown chance of problems--some fraction of people are crazy/angry/smelly, so avoid confrontations--is generally outweighed by expediency. 15) We can't use our MetroCard on the bus. Sure you can. That opens up a whole new universe of travel. If you live in New York City, you can find an enormous array of food cooked by representatives of (and visitors to) countries from around the world. And for those of us who like to explore, there are varieties upon "national" cuisines: not just Thai, but northern Thai; not just Chinese, but northwestern Chinese. Brooklyn is the heart of "Russian" New York, though that's a misleading shorthand. A significant population of "Russian" Brighton Beach is Ukrainian, while other Former Soviet Union populations about: Georgian, Tajik, Uzbek. 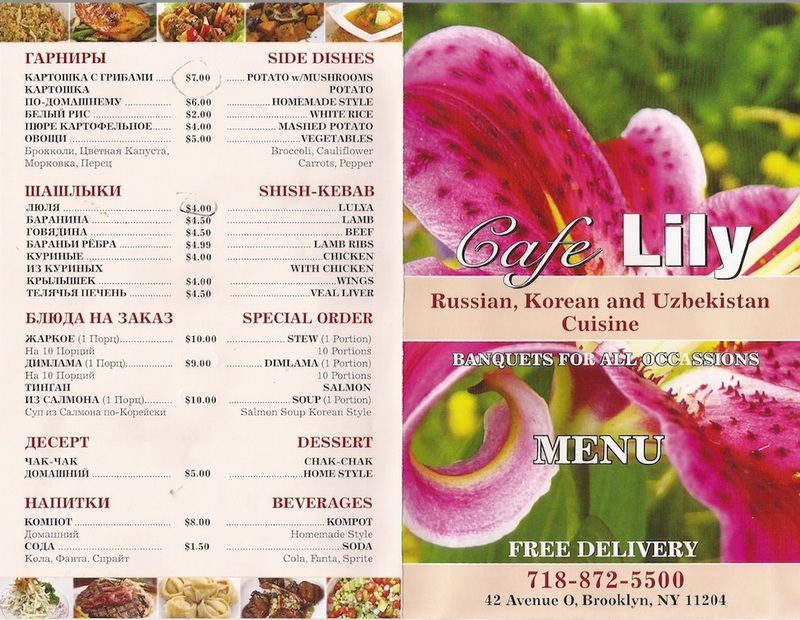 And while there are several places to get hearty, flavorful Uzbek food, I have visited all three of one of the more unusual hybrid restaurants, which serve Korean-Uzbek food. That reflects, as food writer Dave Cook explains, "the culinary history of ethnic Koreans who were forcibly relocated during the Stalin era from the Soviet Far East to Central Asia." 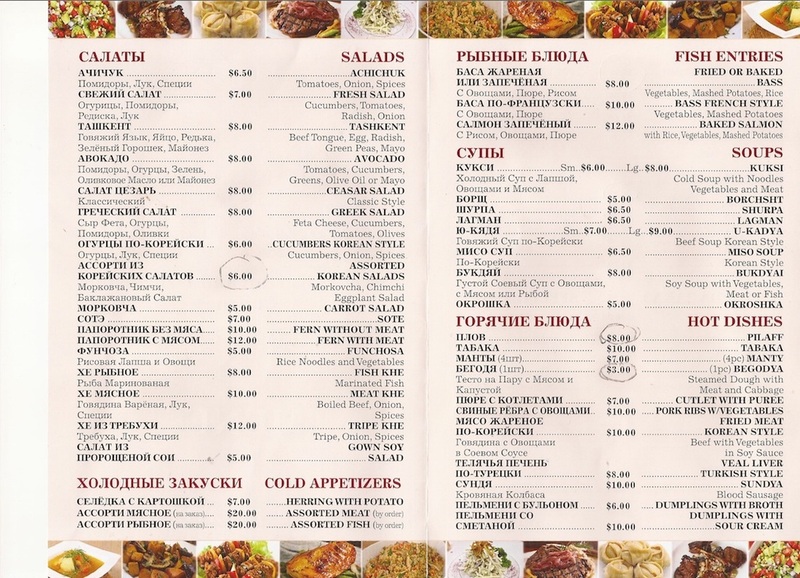 That unfortunate history is reflected more benignly today in menus that serve spicy Korean salads like kimchi (spelled differently in the menu below), along with more traditional Uzbek fare like kebabs and pilaf (aka plov). There's not much ambiance (though diners seemed happy), and we could BYOB. We got a huge amount of food for a relatively small amount of money, and leftovers for the next day. And, yes, a small group on a private tour of Bensonhurst or Coney Island/Brighton Beach can visit these places with me (or afterward). 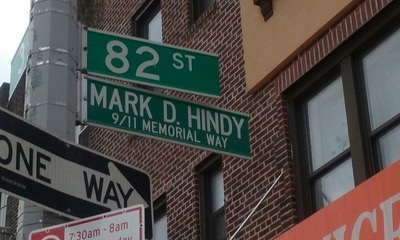 Heck, if you'd really like to visit after a different tour, I can just point you in the right direction. Where in Brooklyn Was "Bridge of Spies" Filmed? As I was watching the recent Steven Spielberg film, Bridge of Spies, about a Brooklyn lawyer who defended Soviet spy Rudolf Abel and then negotiated an exchange for a captured American pilot in the midst of the Cold War, I noticed something: lawyer James Donovan (played by Tom Hanks) and family lived in a house on a Brooklyn street quite familiar to me. Indeed, as this Brooklyn Eagle article explains, they rented a gorgeous turn-of-the-century home in Ditmas Park, not all that far from where I once lived (in a modest apartment), and close to--or, potentially part of--the route for my (Not Just) Victorian Flatbush tour. The Donovan family actually did not live in Ditmas Park/Flatbush during the time depicted in the film--though this neighborhood is understandably a favorite for filmmakers and TV producers because it offers grand houses, reasonable space for street parking, and a lower density of neighbors who might get annoyed. ​According to Philip J. Bigger's biography Negotiator: The Life and Career of James B. Donovan, by 1957, five years before the exchange of prisoners, the Donovans had moved from a freestanding home in Bay Ridge, in southwest Brooklyn, "to a fifteen-room, bi-level apartment at 35 Prospect Park West... overlooking Prospect Park." Wowza. As described on Streeteasy, "designed by the architect Emory Roth, 35 Prospect Park West is a white-glove co-op building with a full maintenance staff and private basement storage for each unit. The 1929 building is home to 74 units over 18 stories, comprised of single floor two bedrooms and spacious duplex four and five bedrooms." It's located (map) between Montgomery Place and Garfield Place--and on the routes for my Brooklyn 101, Brooklyn 202, and Park Slope tours. In case you're wondering, a 9-room duplex there sold for more than $5 million in 2008. So it's an even more impressive piece of real estate than the one they used for filming. Also, I'm sure there would be way more hurdles for anyone attempting to film there. The Brooklyn Eagle article, by the way, notes that the film was also shot in the Brooklyn neighborhoods of DUMBO and Brooklyn Heights. 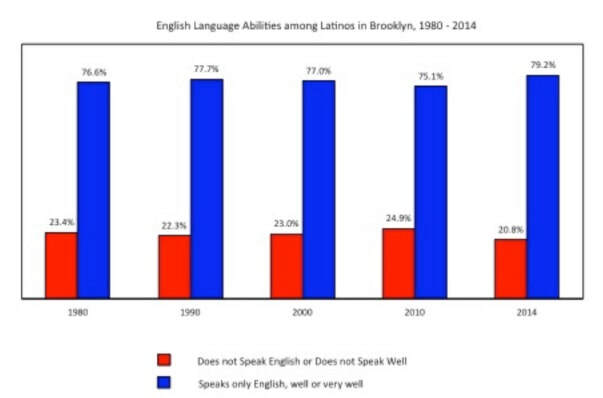 This article from Business Insider (via The Real Deal) is fascinating: it shows the most common languages in New York City beyond English and Spanish, in each Community District, which contain 200,000 to 300,000 people. 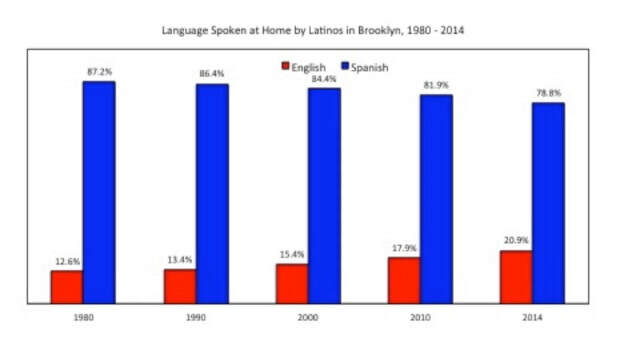 Brooklyn has significant numbers of Chinese, French Creole, Yiddish, and Russian speakers. 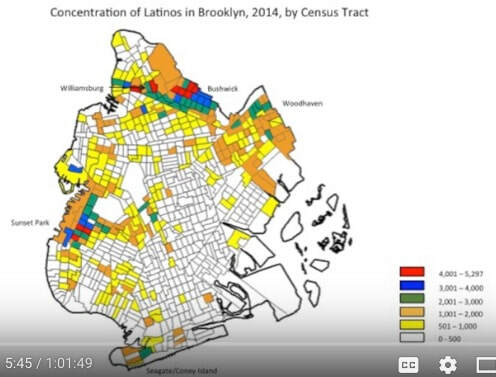 Another map shows that Chinese, French Creole, and Yiddish actually outpace Spanish (the most common language other than English) in five Brooklyn Community Districts. New York TImes financial advice columnist Ron Lieber, in his column yesterday surveying index-card summaries of financial advice, cited two index cards, including his own, that stressed the importance (as he put it) of Experiences>Stuff. That dovetails with my own goals--I don't covet a fancy TV or nifty furniture, but I do seek to travel more. And it of course fits with my work as a tour guide, especially the kinds of tours I lead. No, these are not "experiential tours" in which someone learns how to make a pizza or brew beer. But they are experiences that most people would not find on their own, which introduce them to layers of New York and Brooklyn and individual neighborhoods. My Australian clients the other day, who said they always stay in Manhattan but hardly ever get to Brooklyn, wanted a look at Jewish Crown Heights, having heard so much about the Lubavitch Hasidic movement. ​That turned into a longer visit to more of Crown Heights, and pieces of adjacent Prospect Heights and Park Slope, with the elements comprising an experience they appreciated but didn't even know they had wanted. In preparing for my Williamsburg tour Sunday (via the Municipal Art Society), I noticed the spiffy, six-story loft building 573 Metropolitan, which StreetEasy (and the building web site) tells me is "Williamsburg’s newest luxury loft building!" One-bedroom units rent for more than $3,000. I've spent enough time in Williamsburg to know there's a lot more to the story--and there is. 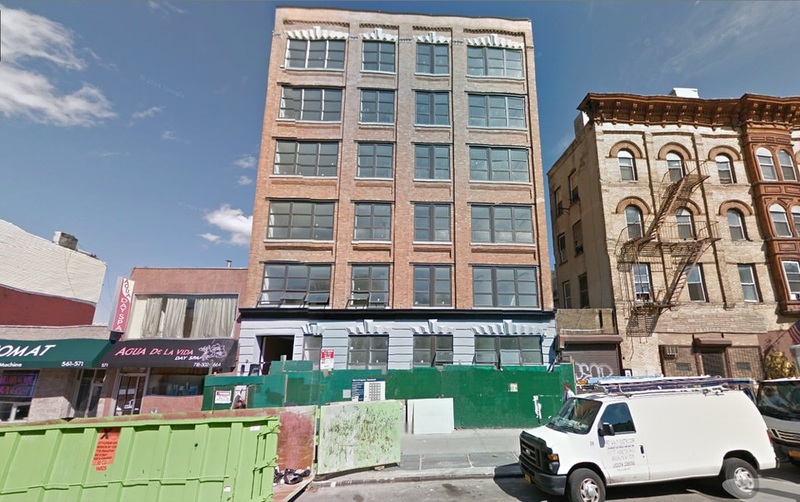 As with more than a few luxury lofts, 573 Metropolitan Avenue housed humble manufacturing businesses, and for at least some of the time could have been called a sweatshop. Perusing the Daily Eagle, I saw a 1937 advertisement for canvassers to sell floor lamps, a 1940 business opportunity to buy a 5,000 square foot garment factory (one floor? ), a 1948 ad seeking operators for ladies coats, and a 1950 ad seeking operators for Jo-Ann Sportswear. In 1942, according to the Daily Eagle, the Metropolitan Cloak Company at that location was enjoined by the court for wage and hour violations. In 1957, labor racketeering charges were filed involving a bogus garment workers union and the Vogue Knitwear company, according to the New York Times. Then came the "art center and studio/co-working space 3rd Ward," as described by Hyperallergic's Mostafa Hedday, which leased 573 Metropolitan in 2005, and saw it shut down on Oct. 15, 2010 for code violations, three years before 3rd Ward itself crashed and burned. Last June, the Times announced an 18-month lease, at $24/square foot, for State Senator Martin M. Dilan "for 2,000 square feet on the lower level of this six-story building, which was gut renovated in 2011." And this area around the second L stop in Williamsburg is home to a new wave of development. The factory jobs? They've either moved deeper into industrial Brooklyn or, more likely, gone completely. For the current building's status, see 573Metropolitan.com. 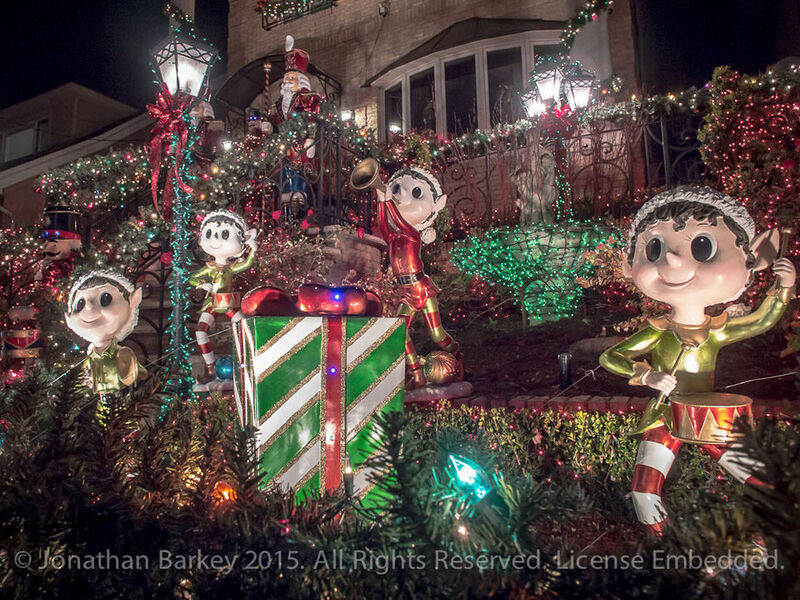 I lead a number Dyker Heights holiday lights tour each season: a bus tour or two, one or two large group walking tours, and several smaller group tours, using a limo or public transit. For the first time, last night, a client booked me for Christmas Eve. The three were a lot of fun, and open to seeing more: I told them that we could go there directly, but if they had the time/inclination, we should make a few stops and see more on the way. So, after meeting in Manhattan, we went first to DUMBO, and walked around there and then Brooklyn Heights. We took the subway to Brooklyn's Chinatown in Sunset Park, which was buzzing, as expected. We had an astoundingly inexpensive quick dinner at the estimable Yun Nan Flavour Garden. Then a quick bus ride to Borough Park, home to Brooklyn's largest Orthodox/Hasidic Jewish population, which bustled, unfazed by Christmas Eve. Then a short subway ride to the edge of Dyker, and a walk to the first set of highlights. Then a quick bus ride, and a stop at the fantastic, frenetic but still open Tasty Pastry. Then we walked through the heart of the Dyker lights, and it was mobbed, even without the regular bus tour groups. I and others had wondered: would any of the lights be off on Christmas Eve? Answer: I noticed two houses with major installations that were off, but that detracted only very slightly from the overall experience. Interestingly enough, a large number of the visitors were Chinese (likely Buddhist?) and Muslim (women in headscarves; families could be Middle Eastern or Bangladeshi). That makes sense; more traditional Christmas celebrants would be in church or at home. We caught a quick bus to Bay Ridge and took the subway back north. A very well-spent five hours! For the record: four subway trips (plus two internal transfers), three bus rides, and some very good transit karma, with short waits for nearly all. But only four total fares, given free transfers. They're real, and they're spectacular. Above is a gif, below, a still photo. I shot both these videos tonight, which means, yes, the holiday season is in full swing. Even if not all the lights and displays are up--I estimate it at 60-75% of full strength--it's still a great visit, especially given the absence of crowds. ​Yes, we stop outside the above house on pretty much all my Dyker Heights tours. As to the house below, well, we'll stop by on some tours. Where in Brooklyn Was "Brooklyn" (aka #BrooklynMovie) Filmed? 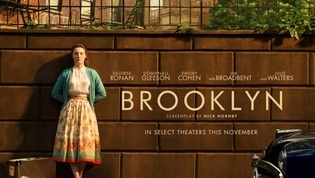 I recently saw the touching film Brooklyn, directed by John Crowley, based on the novel by Colm Toibin. Yes, it's primarily a portrait of the challenges a young woman from Ireland faced in truly leaving home and family, and finding her path in New York City, not without some twists and complications. Clinton Street today runs from Carroll Gardens through Cobble Hill, then across Atlantic Avenue into Brooklyn Heights. Presumably Eilis and her beau Tony were walking around the part that today is called Carroll Gardens but back then was just undifferentiated "South Brooklyn," before new residents and the real estate industry pushed for new names. Back then, it was a working-class zone. Today, those brownstones are very, very precious. By the way, according to a Crowley interview with Deadline Hollywood, they shot for exactly one day in the brownstone district and one day in Coney Island, with the rest of the shoot in Montreal to save money! ​Here's another relevant Crowley quote, from Brooklyn magazine: "Modern-day Brooklyn is so different from 50s Brooklyn that the art department budget would be astronomical." It's a crude shorthand, I know, for the complicated phenomenon of gentrification that involves people's homes and businesses and lives, an issue that comes up in most of my tours. 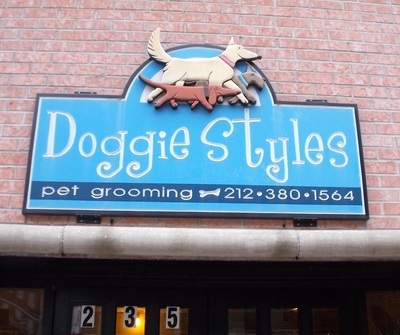 But... the three clearest signs of retail gentrification, I like to say, involve expensive coffee (well beyond Starbucks), yoga/Pilates, and dog grooming/doggy day care. And it just so happens the field of dog-related services lends itself to puns (as does the human hair salon business, I'm reminded). Please note: I have nothing against these establishments! But they do provoke chuckles. Observations and ephemera related to my tours and Brooklyn. Comments and questions are welcome--and moderated.